Potatoes are rich in Potassium and an excellent source of highly digestible carbohydrates for energy. Potatoes are often used in foods that do not contain grain. 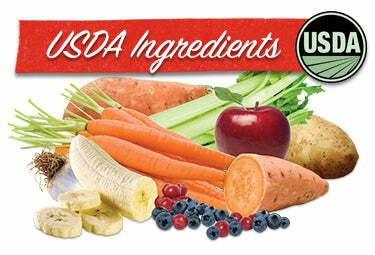 Potatoes, Flax, Sweet Potatoes, Carrots, Celery, Apples, Bananas, Blueberries, Cranberries, Pumpkin, Garlic, Vitamin A Supplement, Vitamin D3 Supplement, Vitamin E Supplement, Niacin Supplement, Iron Proteinate, Calcium Carbonate, Phosphorous, Zinc Proteinate, Riboflavin Supplement, Thiamine Mononitrate, Potassium Chloride, Manganese Proteinate, Copper Proteinate, Magnesium Chloride, Pyridoxine Hydrochloride, Vitamin B12 Supplement.